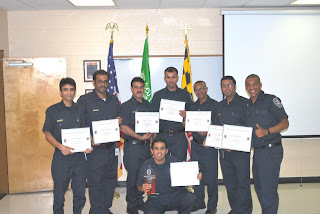 The Prince George’s County Fire/Emergency Medical Services (EMS) Department is proud to partner with the International Association of Fire Chiefs (IAFC) to host eight firefighters from Saudi Arabia Aramco for a fellowship training program. This IAFC managed fellowship program was recently completed in the San Diego and Oklahoma City Fire Departments, and another cohort has just started training in Rogers, Arkansas, with all involved agencies announcing their programs as a success. This fellowship program will last for six (6) months, essentially entrenching the Saudi Aramco firefighters into our fire/EMS stations for the purpose of them gaining experience from our policies and tactics. The eight firefighters recently completed their PGFD orientation at our Training and Leadership Academy (TLA). This experienced group of firefighters will be assigned to specific stations across the County and will be operating on fire apparatus, under the supervision of the individual station officers. Each of the Aramco firefighters has been assigned a Fire/EMS Department mentor to assist them with their acclimation to the United States and to Prince George’s County.